The Ferry Avenue Branch of the Camden County Library opened in 2005 as a branch of the Camden Free Public Library. The library was built through the efforts of then Freeholder Riletta L. Cream, for whom the library is now named, and was a result of cooperation between the Camden County Freeholders, the Camden Free Public Library, and the City of Camden. 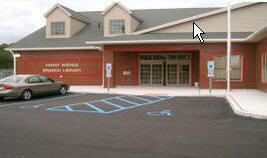 On February 14, 2011, the branch was brought into the Camden County Library system as a branch, with new staff, new hours, and new policies. On April 26, the library was renamed the Riletta L. Cream Ferry Avenue Branch Library, in honor of Freeholder Cream, at the Grand Opening Ceremony. The Library has 15,000 square feet, and a very modern, spacious feel. The impact of the county presence has been outstanding for the library, its collection, appearance and maintenance of facilities. As a result, all measures of usage have soared, including computer usage with additional faster and more powerful computers, an almost ten-fold increase in the circulation of materials, and more innovative and exciting programs for customers of all ages. See photos of the Ferry Ave. Branch. More photos on Flickr.